The unique IWC Fliegeruhren 326802 pilot watch is design and function in a beautiful combination that pleases the eye. It is a uniquely attractive pilot’s watch that not only appeals to professionals. The IWC Fliegeruhren 326802 Pilot watch is a truly classic timepiece that reflects the traditional mastery of pilot watches with a modern flair. No longer intended only for professionals, a pilot’s watch from IWC has broken through the range of uses for luxury watch lovers. The IWC Fliegeruhren 326802 pilot watch has a beautiful arabic numerals, Color green, Markers and skeletised hands with superluminova dial and 21 jewels, Power reserve 72 hour, Glucydur balance wheel, Half-oscillations A/h 28800, Mechanical movement self winding, IWC caliber C.32110 movement, which are wrapped in a solid case. The watch comes with functions like Date, Second stop, Hour minute, Central second. It is difficult to confuse the attention to detail and craftsmanship of this watch. Find other Pilot Watches in the pilot watch category. This pilot watch has the product status New and is instock. If you order this copy, the watch is delivered with Original Box and with Original Papers. Of course, all our new watches come with the corresponding manufacturer warranty. Take a closer look at our IWC luxury watch. You will quickly see why it is one of the bestsellers in our extensive range of luxury watches. Discover the world of IWC watches and learn more about IWC on the Manufaktur Webseite. Take a look at our other exclusive luxury pilot watches and see why IWC and other watch brands are so seductive. Rattapante is a leader in the online luxury watch market. 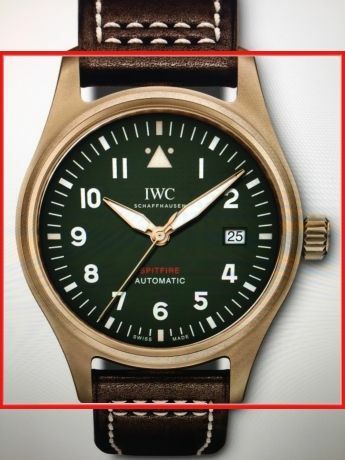 From new, unused to used watches, we offer only the highest quality watches, including the IWC Fliegeruhren 326802. Rattrapange is headed by a true luxury watch connoisseur with decades of experience in the industry. Let Rattrapante help you identify the best luxury watch for your collection. Contact one of our watch experts and get started today. Let one of our enthusiastic watch consultants help you to find the right luxury pilot watch for your lifestyle. We will gladly take care of all the details during the purchase process and offer you first-class conditions at all times. You are not yet sure which luxury watch should be the next in your collection? No problem! Browse our watch catalogue and be sure to check out the detailed information on our Top Brands such as Breitling, Hublot, IWC, Omega, Officine Panerai, Tag Heuer and Zenith.